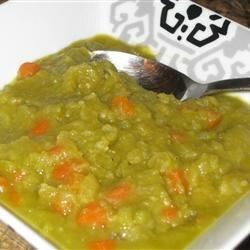 "To make a delicious Pea Soup without all the fat simply substitute chicken stock for most of the liquid in your favorite recipe! The soup will cook down and be flavorful, though mild in taste. My family loves this substitute!" I used the recipe, but opted to put a little bacon in it and it turned out great. Great soup. Simple and delicious. I did add a bit of bacon and some seasonings. It was THICK and hearty. I believe the trick is to not rush it and it thickens beautifully.